Ever since Google announced RankBrain, a machine learning algo, there has been much speculation about what other parts of the search algo Google might use machine learning in. While they have said Penguin is not a machine learning algorithm, there is speculation that other parts of the search algo could incorporate machine learning, especially with comments John Mueller made recently about machine learning being used in a lot of Google’s systems. No. I can probably say that it will never take over the whole algorithm, or the core algorithm. It is one of the components we have in ranking. And it’s really just one of the signals we have. Machine learning is a tool. It’s like having a Swiss knife. You can use it for many things, it’s not appropriate for everything, but you can use it in many cases. Just like a Swiss knife, you probably don’t want to try to use in concrete because it will not work. The same way RankBrain will not work for all queries, but in other similar uses, it will really make your life much easier, so we are using it where we can. Obviously we are not trying to replicate all our manual algorithms, that doesn’t make sense for us. If it is working well, we prefer not to touch an algorithm. But we are experimenting with what else we can do with ranking and in other products in general with machine learning. Enge then asked why they wouldn’t use machine learning whenever possible. Scarce data for example. If you are training data for a machine learning algorithm is pretty scarce, then you will get pretty weird results. We have this problem all the time where either we pick the wrong training set, the wrong data and the results are odd or we just don’t have enough data to start using machine learning for example. Then we have to step back and you have to ask yourself if machine learning the right approach to this problem that we want to solve, or would a manual algorithm do much better? And very often, a manual algorithm would do much better just because of the amount of data or your data is just way too noisy for it. It is interesting that Google wouldn’t automatically choose to go with a machine learning algorithm in cases where the manual algo is working fine, as it shows that Google isn’t automatically changing all their algos and signals over to machine learning. 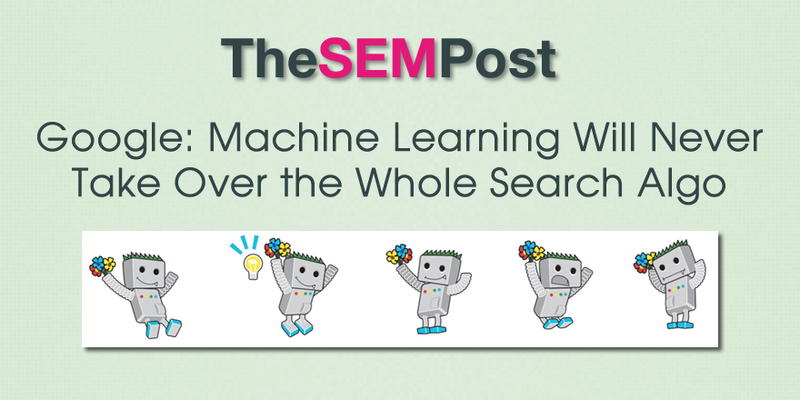 And while machine learning has a lot of advantages in many ways, it would also mean SEOs would need to learn and adapt to a whole new SEO game as machine learning is not as predictable as a manually designed algo is. But for those expecting that Google would be changing their entire Google search algo to a machine learning one, it seems like this is not on Google’s roadmap anytime soon.